For a wide range of reasons including lack of funding, landowner concerns, politics and a general lack of appreciation of the benefits of rural trails, progress has been relatively slow in getting traisl constructed. However, there have been successes. Red Deer County, Lacombe County and Ponoka County have each completed at least some sections of the Trans Canada Trail and other trails. The rural municipality that has completed the most is Lacombe County which completed the Blindman River Bridge in 2010 as well as a paved trail from the bridge to Blackfalds. 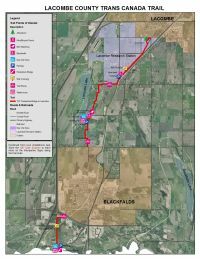 A paved trail linking Blackfalds and Lacombe was completed in 2012 and officially opened in 2013 (see Lacombe County TCT map). The final section from Lacombe to the Ponoka County boundary was expected to be completed in 2017 but it has been postponed. There is also a natural trail system near the Nova Chemicals plant near Joffre. A successful 3.4 km trail has linked the town of Bentley with Aspen Beach at Gull Lake along Highway 12 for several years. Ponoka County has completed a gravel section of Trans Canada Trail south of Ponoka towards the Lacombe County boundary that is partially equestrian but requires some maintenance. Red Deer County adopted in June 2009 the award-winning Open Spaces Master Plan that outlined a plan to create several rural trail linkages throughout the county over several years. The plan included a trail linking Red Deer with Sylvan Lake using the historic 2,100-foot Mintlaw trestle, an abandoned railway bridge that is owned by the county. The only completed section of Trans Canada Trail in Red Deer County is a 1-km paved section through a natural area that was completed in 2010 south of the hamlet of Springbrook. There are also a few connecting gravel trails, one with a boardwalk. There is also a paved trail along Airport Drive in Springbrook that will become part of a trail loop in the hamlet. A plan to construct a trail between Red Deer and Springbrook has been indefinitely postponed. It is anticipated that the paved trail in the Springbrook natural area will eventually link with Penhold. South of Penhold, there is a plan to link the town to Innisfail and eventually Bowden but this could be years away. The City of Red Deer and Red Deer County adopted the Red Deer River Valley and Tributaries Park Concept Plan in 2010 that would extend the city's popular Waskasoo Park into the County along rivers, tributaries and abandoned railway lines.